The challenges in curating research data: one case study. Research data (and its management) is rapidly emerging as a focal point for the development of research dissemination practices. An important aspect of ensuring that such data remains fit for purpose is identifying what curation activities need to be associated with it. Here I revisit one particular case study associated with the molecular structure of a product identified from a photolysis reaction and the curation of the crystallographic data associated with this study. Is asking a question such as “what is the smallest angle subtended at a chain of three connected 4-coordinate carbon atoms” just seeking another chemical record, or could it unearth interesting chemistry? Here is a little molecule that can be said to be pretty electron rich. There are lots of lone pairs present, and not a few electron-deficient σ-bonds. I thought it might be fun to look at the stereoelectronic interactions set up in this little system. Celebrating Paul Schleyer: searching for hidden treasures in the structures of metallocene complexes. A celebration of the life and work of the great chemist Paul von R. Schleyer was held this week in Erlangen, Germany. There were many fantastic talks given by some great chemists describing fascinating chemistry. Here I highlight the presentation given by Andy Streitwieser on the topic of organolithium chemistry, also a great interest of Schleyer's over the years. I single this talk out since I hope it illustrates why people still get together in person to talk about science. Chiroptical spectroscopy of the natural product Steganone. Steganone is an unusual natural product, known for about 40 years now. The assignment of its absolute configurations makes for an interesting, on occasion rather confusing, and perhaps not entirely atypical story. I will start with the modern accepted stereochemical structure of this molecule, which comes in the form of two separately isolable atropisomers. The first reported synthesis of this system in 1977 was racemic, and no stereochemistry is shown in the article (structure 2). Three years later an “Asymmetric total synthesis of (-)steganone and revision of its absolute configuration” shows how the then accepted configuration (structure 1 in this article) needs to be revised to the enantiomer shown as structure 12 in the article and matching the above representation. The system has continued to attract interest ever since,,,, not least because of the presence of axial chirality in the form of atropisomerism. Thus early on it was shown that the alternative atropisomer, the (aS,R,R) configuration initially emerges out of several syntheses, and has to be converted to the (aR,R,R) configuration by heating. One could easily be fooled by such isomerism! The 5σ-confidence level: how much chemistry achieves this? I was lucky enough to attend the announcement made in 2012 of the discovery of the Higgs Boson. It consisted of a hour-long talk mostly about statistics, and how the particle physics community can only claim a discovery when their data has achieved a 5σ confidence level. This represents a 1 in 3.5 million probability of the result occurring by chance. I started thinking: how much chemistry is asserted at that level of confidence? 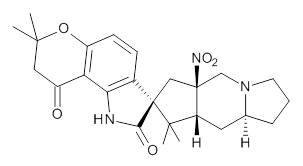 Today, I read Steve Bachrach’s post on the structure of Citrinalin B and how “use of Goodman’s DP4 method indicates a 100% probability that the structure of citrinalin B is (the structure below)”. Wow, that is even higher than the physicists. Of course, 100% has been obtained by rounding 99.7 (3σ is 99.73%) or whatever (this is one number that should never be so rounded!). But there was one aspect of this that I did want to have a confidence level for; the absolute configuration of citrinalin B. Reading the article Steve quotes, one sees this aspect is attributed to ref 5, dating from 2005. There the configuration was assigned on the basis of “comparison of the electronic circular dichroism (ECD) spectra for 1 and 2 with those of known spirooxiindole alkaloids“. However, this method can fail. Also, one finds “comparison of the vibrational circular dichroism (VCD) spectra of 1 with those of model compounds“. Nowadays, one would say that there is no need for model compounds, why not measure and compute the VCD of the actual compound? Even a determination using the Flack crystallographic method can occasionally be wrong!. Which leads to asking what typical confidence levels might be for these three techniques, and indeed whether improving instrumentation means that the confidence level gets higher with time. OK, I am going to guess these. The subtle effect of dispersion forces on the shapes of molecules: benzyl magnesium bromide. In the previous post I mentioned in passing the Grignard reagent benzyl magnesium bromide as having tetrahedral coordination at Mg. But I have now noticed, largely through spotting Steve Bachrach’s post on “Acene dimers – open or closed?” another geometric effect perhaps worthy of note, certainly one not always noted in the past; that of dispersion forces. This is a continuation of the discussion started on Steve Bachrach’s blog about a molecule with a very short H…H interaction involving two Si-H groups with enforced proximity. It had been inferred from the X-ray structure that the H…H distance was in the region of 1.50Å. It’s that cis-butene all over again! So is that H…H region a bond? Is it attractive or repulsive? Go read Steve’s blog first. X-ray analysis and absolute configuration determination using porous complexes. This is another in the occasional series of “what a neat molecule”. In this case, more of a “what a neat idea”. The s-triazine below, when coordinated to eg ZnI2, forms what is called a metal-organic-framework, or MOF. A recent article shows how such frameworks can be used to help solve a long-standing problem in structure determination, how to get a crystal structure on a compound that does not crystallise on its own. To be cyclobutadiene, or not to be, that is the question? You decide. A quartet of articles has recently appeared on the topic of cyclobutadiene.,,,. You will find a great deal discussed there, but I can boil it down to this essence. Do the following coordinates (obtained from a (disordered) previously published x-ray refinement) correspond to a van der Waals complex of 1,3-dimethyl cyclobutadiene and carbon dioxide, or do they instead represent a covalent interaction between these two components resulting in a compound with the chemical name 2-oxabicyclo[2.2.0]hex-5-en-3-one (i.e. not a cyclobutadiene)? To be cyclobutadiene, or not to be, that is the question? You decide. is licensed by Henry Rzepa under a Creative Commons Attribution-Noncommercial-Share Alike 3.0 United States License.